Looking for a forgiving easy to travel with medium for quick sketching or beautiful finished pieces? Gouache may be a solution. It's pronounced 'goo-wash' and it is basically opaque watercolor (watercolor pigment with calcium carbonate added for opacity). It sits somewhere between oil paint and watercolor with, as far as I'm concerned, the best attributes of both. Thinly applied in washes you can do all those cool watercolor things with it like wet in wet and dropping in jewels of color wherever you feel like it. Thickly put on it covers like oil paint. Use it with watercolor or oil brushes. All you need is a white plate, a brush or two, a glass of water, and half a dozen pigments (a warm and a cool of each primary). Here is an example from several years ago when we were camping at Talley Lake, MT. Notice the initial washes that make up the background trees and the water that were put on as if I was using regular watercolor. Then, using thicker paint, I put in the sky, some of the light struck areas in the trees and water and ended with a few darks. Or maybe I put in the darks and then the lights....unlike watercolor, with gouache you can do either order. 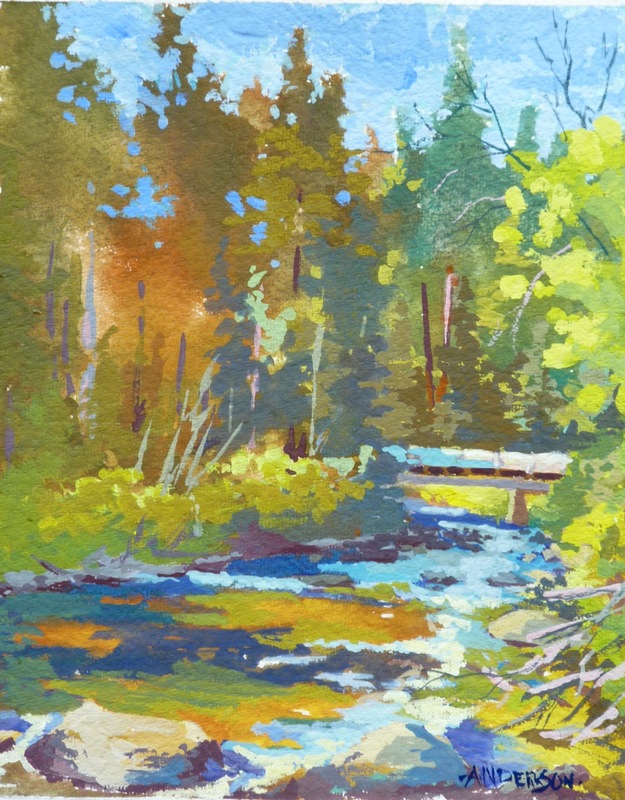 Because it was a hot day and I only needed water to paint I sat in the middle of the creek to do this. Here is another done on the shores of Lake Megunticook in Camden ME. 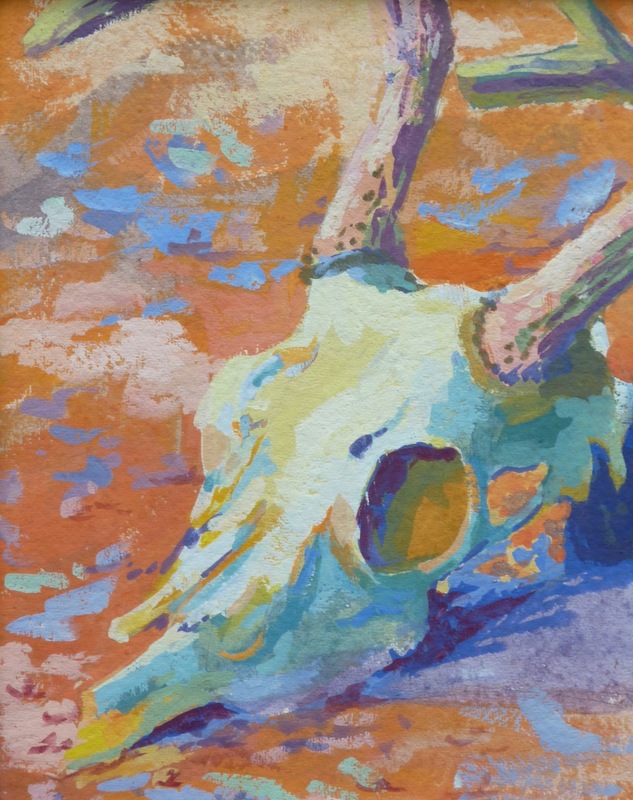 The blue shadow, some of the skull and the orange ground is wash. The rest is thick opaque paint. It drys quickly so you can paint over it, BUT because it redissolves in water you can soften edges if you want. 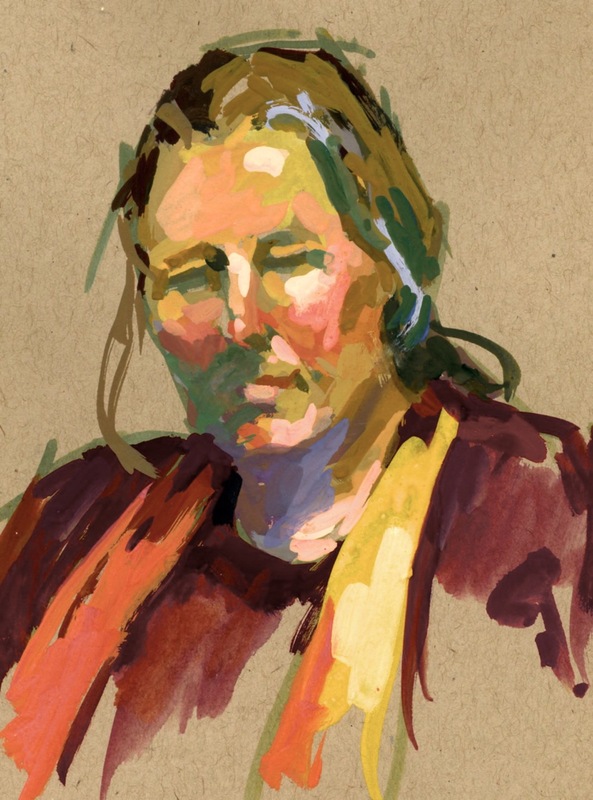 I used to travel on the ferry with a small watercolor kit, a small toned sketchpad and a tube of white gouache. With the watercolor I had transparency but when I added the white gouache I could make opaque paint. Using it made it easy to paint people as they were reading or sleeping. And one more of my friend and fellow artist (extraordinary artist), Debbie. I've posted a work in gouache here. Take a look. Give it a try. It may be your new thing. Another friend, Joe Kresoja, is a whiz with gouache figure work and has a book out on Blurb.